Unless you’ve been living under a rock for the past five years or so, you’ve likely noticed that craft beer is a hot industry here in Ottawa and across Ontario. The number of breweries in this province, including brew pubs and contract brewers, currently sits at more than 250. In fact, the growth of breweries across Ontario, combined with the seemingly limitless love Ontarians have developed for crafty suds, has helped change some very old laws. Earlier this year, the Ontario government announced major changes to the way beer is sold in this province. While previously beer could be purchased only at the approximately 600 LCBO outlets or 450 Beer Store locations, 450 grocery stores will soon be allowed to carry beer. In addition, The Beer Store will eventually pay a higher tax and will no longer be able to charge higher prices to small commercial establishments. And there will be mandatory profiling of local craft beers in stores to help promote the craft beer industry, which is essentially any Canadian brewery or beer outside the big macrobreweries. For those wondering how we got here, a quick history lesson. In days of yore, the local brewery was a common establishment in communities across Ontario. Before World War I, Canada was home to 117 independent breweries. Not bad for a nation of Canada’s size at that time. Prohibition, that dark period when both production and consumption of alcohol were illegal, lasted in Ontario from 1916 until 1927. Though some breweries survived those days of temperance, most did not. In the post-Prohibition liquor law reform boondoggle, a handful of larger breweries were able to acquire smaller ones across the province. Though it made smart business sense, this consolidation of the beer market limited the creativity, flavours, and styles brewed, because beer was put under the control of a small number of large Canadian breweries. By the early 1980s, the three largest breweries (Molson, Labatt, and Sleeman), owned 96 percent of the market. Fast-forward to the mid-2000s, and these large breweries had gradually been bought out by major international companies, such as Belgium’s Anheuser-Busch InBev, which now owns Labatt. In short, big business became the norm and popular styles of beer (mostly lagers) were mass-produced by the few breweries. The changes that are currently happening in the beer market have come on quickly. For reference, Beau’s All Natural Brewery, now one of the major breweries in Ontario, opened its doors on Canada Day of 2006. Ottawa and Ontario have come a long way since then. This illustration uses Ontario Beer Network (OBN) figures to show the outstanding growth the craft beer industry has seen in Ontario. These include contract breweries (which brew their recipes in the breweries of others) and brew pubs (basically a restaurant with a small brewery within), as well as breweries. The OBN statistics show things really started to escalate in 2012, when 22 new breweries emerged; that number grew to 31 in 2013, continued to grow to 48 in 2014, and dipped slightly in 2015 with the arrival of 27 new breweries. What is even more telling than the growth over the past few years is the continuing confidence of investors in this sector: more than 70 breweries are currently in development. I hope you’re thirsty! The Ottawa area is already home to more than 20 breweries, with still more proposed. It’s a challenging industry for a consumer (or beer writer) to keep up with. With so many new players entering the game, it’s an appropriate time to examine whether the beer market is over-saturated. Can a community be awash in craft breweries? To answer that question, we looked at the breweries, in production or proposed, and filtered out the brew pubs and the contract brewers to come up with the physical manufacturers of beer. This leaves about 170 locations across 80 communities in Ontario. Using a basic calculation of 2011 Census data combined with the number of local breweries, the average number of residents per brewery is around 68,000. That’s about the size of Sarnia. Ottawa’s per capita score is above the population average and closer to the median, with one brewery per 44,000 residents. In Ontario, O-Town has the second most breweries, after Toronto. This is no surprise, since Ottawa has the second largest population after Toronto. But there are some interesting outliers: Prince Edward County has six breweries (counting those up and running or soon to be). This is likely driven by the local tourism sector. Kitchener, with its Germanic Oktoberfest heritage and nearly a quarter million residents, has but a single brewery even though neighbouring Waterloo has numerous breweries. I lived in that community for years and have trouble comprehending why this is, but Beau’s might help explain the phenomenon. An obvious outlier in little Vankleek Hill, Beau’s helps demonstrate that a brewery’s market can extend well beyond its community boundaries. You can find Beau’s across Ontario, into Quebec and in the United States. They’ve grown their team from six to more than 120. 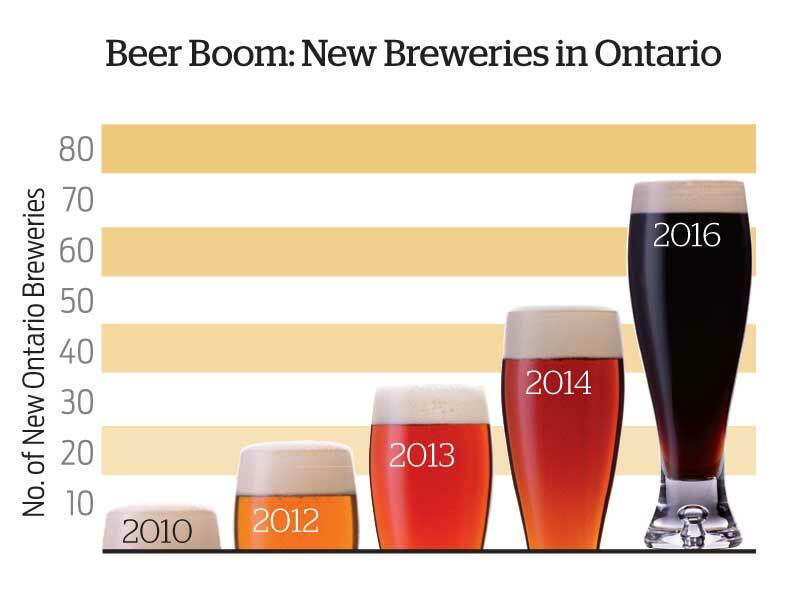 Data from the LCBO can also shed light on the craft beer market in Ontario. According to the LCBO, the total estimated value of Ontario’s beverage alcohol market, including beer, is $10.3 billion. The LCBO splits that large beverage alcohol market with The Beer Store (TBS). The LCBO reports $4.997 billion in net sales and other income; 21 percent of their sales comes from beer, which (despite my spending habits) is lower than both wine and spirits. Of course, we know the LCBO isn’t the major distributor of beer in Ontario; rather, TBS controls 80 percent of the beer market. Using a rough calculation based on LCBO figures, TBS would rake in about $5 billion in beer sales alone, since they don’t sell wine or spirits. It’s important to recall that TBS is owned by three large breweries — Labatt Brewing Company, Molson Coors Brewing Company, and Sleeman Breweries. Though it’s less clear how craft beer is trending at TBS, the LCBO Annual Report 2013–14 indicates: “Ontario craft beer sales led all beer segments again, with sales growth of 27 percent.” That’s extraordinary growth. But while the market is large, smaller breweries still get only a small slice of the pie. Ontario Craft Brewers, a lobbyist group, reports: “As of 2013, Ontario’s Craft Brewers’ share for premium priced brands was almost four percent of the beer volume sold.” Consider this: if the beer market were a 24 case of beer, four percent would be just one bottle. In short, the craft beer industry is growing, but it’s still tiny. I see this unprecedented brewery growth as positive. Looking at U.S. craft beer market growth as an indicator, there’s plenty of room for more. Ottawa has a lot of breweries and will soon have more. A few years ago, I had no problem ensuring that I was well versed in the latest local offerings; now neither my wallet nor my liver can stay on top of all the new beers flowing in the capital. The new, more open liquor laws and distribution channels should allow for greater competition. This will motivate breweries to build a better beer. I don’t foresee the local market being so competitive that brewers are pushed out — but to remain competitive, taglines of “local” or “craft” are no longer good enough. If a new brewery wants to thrive in this market, it needs to produce a high-quality product. All these numbers are making me thirsty. I need a cold, fresh, locally produced craft beer.